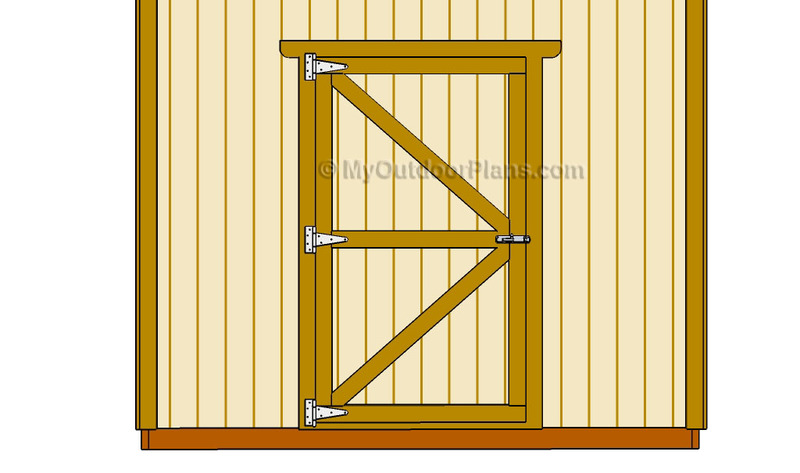 This step by step woodworking article is about free shed door plans. 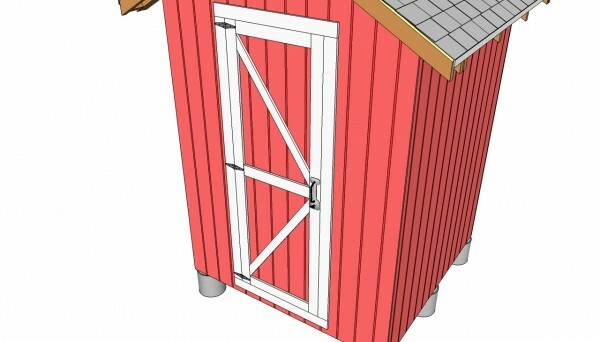 In this article we show you how to build a simple shed door from common material, using tools that can be found in any house. If you follow our step by step instructions, you can get the job done by yourself, in just a few hours, even if you don’t have expertise in the field. Work with good judgement and make sure the corners of the door are right-angled, using a framing square. The size of a shed door can vary extensively, therefore you have to decide this aspect from the very beginning. If you want to store large items (lawn mower, furniture, large generator) inside the shed, we recommend you to measure their size, before designing the width of the door opening. Afterwards, you should decide if you want to install a pre-hung door or to build one by yourself, using 5/8” plywood and 1×4 trims. Building a door for you shed should be an easy process, as compared to the other stages of project. 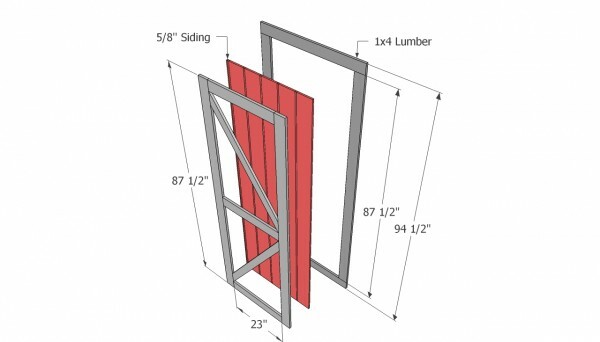 You could either buy a pre-hung door and design the front wall frame according to its dimensions, or you could build one by yourself. Top Tip: The easiest technique is to build the door from the same material as the exterior siding. Therefore, measure the door opening and cut a piece of grooved plywood to the appropriate size. First of all, you need to leave enough space in the wall frame for the door opening. Therefore, you have to decide the size of the shed door from the very beginning. Top Tip: As you can see in the image, you should cut the bottom place, in order to have more space. In addition, you could also install double wall studs on both sides of the door, to increase the rigidity of the structure. 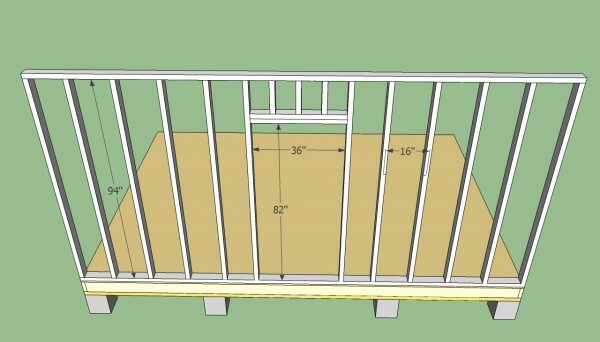 On the other hand, if the walls are too high, you should install a double header and several 2×4 cripple studs. The height of a regular shed door could vary from 78” up to 86”, therefore you should adjust its size according to your needs. Top Tip: Similarly, the width of a shed door ranges from 25” up to 36”. 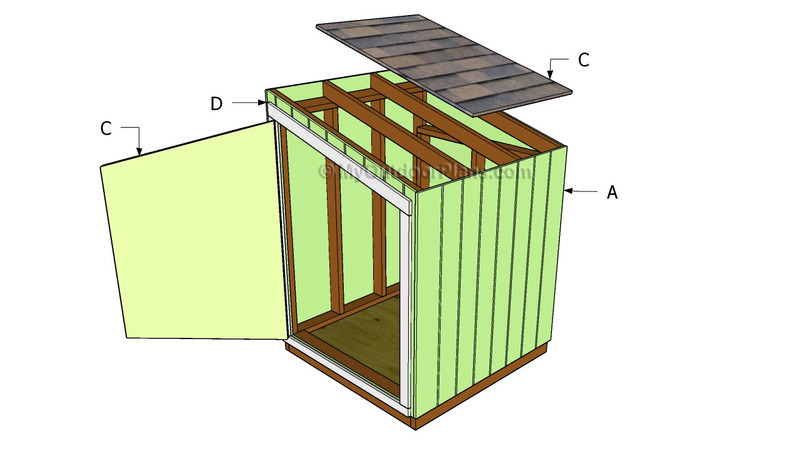 You should assess the objects you will store inside the shed, to design its size accordingly. As we have already said, the easiest way to build a shed door from scratch is to use a piece of 5/8 grooved plywood and several wooden trims. Measure the door opening and cut the plywood, using a saw with a sharp blade. Top Tip: Attach the 1×4 trims along the edges of the plywood, using 1 1/4” nails. 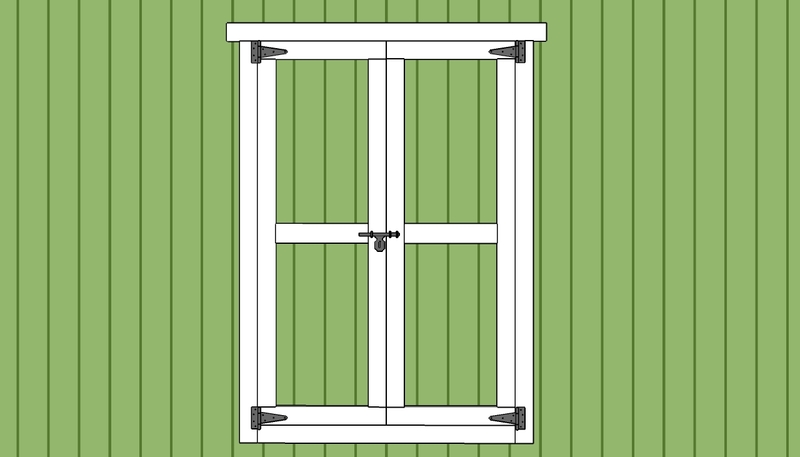 Afterwards, attach 1×4 lumber along the edges of the door opening, as in the free plans. Afterwards, fit the door in the door opening, plumb it thoroughly with a spirit level and lock it into position with several hinges. In order to get an accurate result, we highly recommend you to ask a friend to assist you during the installation. Top Tip: Don’t forget to install the door latch, as you should notice in the image. Work with good judgement and with great attention, if you want to obtain a professional look. After installing door into place and locking it with the hinges, you should make sure it opens properly. As a general rule, a perfectly plumb door will open properly, therefore it’s important to check this aspects before securing the hinges. Top Tip: Install the trims into place, to cover the end rafters, sides of the roof. Apply several coats of paint to the trims, to protect them from water damage and wood decay. 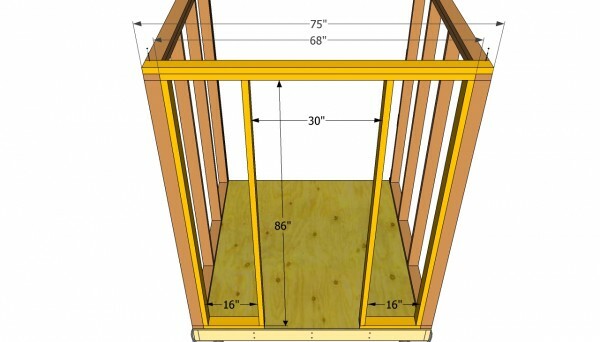 This woodworking project is about gable shed roof plans free. If you want to see more outdoor plans, we recommend you to check out the rest of our step by step projects. 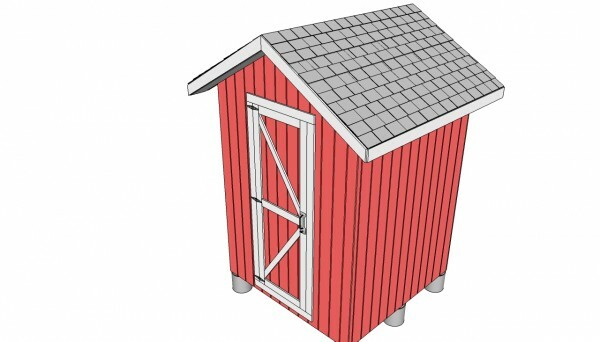 Looking for detailed plans for a 6’X8′ wood shed. 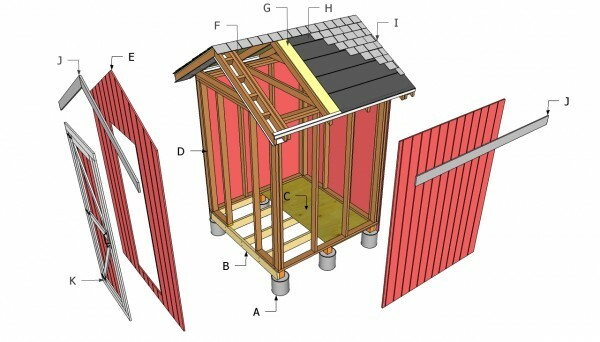 Check out these plans: http://myoutdoorplans.com/shed/saltbox-firewood-shed-plans/ This is a 6×8 saltbox wood shed.